It has been more than a year now since I decided to do the Peerless Nomex 164 construction. By the time I got the kit parts and veneer board it was September before I made a start. 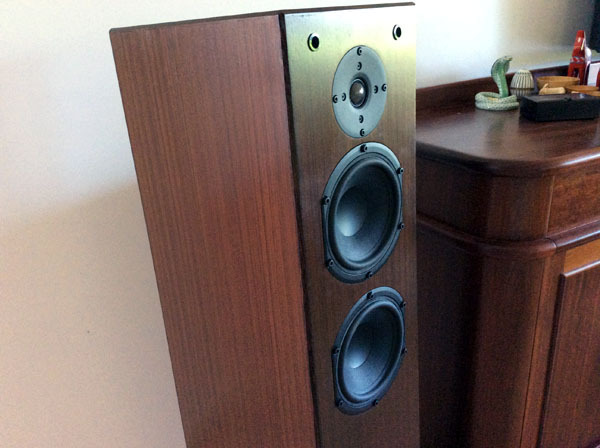 Drivers came from Falcon Acoustics in the UK who gave good service at a good price. The Jantzen crossovers are with superior Z caps. I was very fortunate to have two friends nearby who could help with the project. 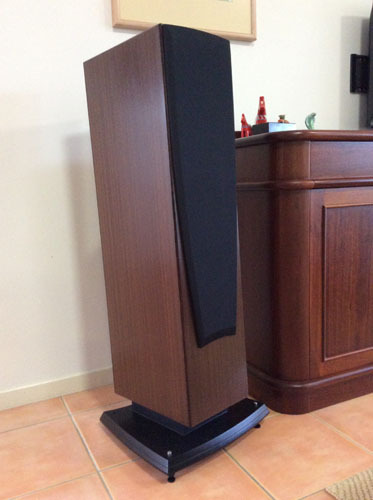 The main person was a Danish cabinet maker retired who also has a lifetime fascination and passion for hifi. 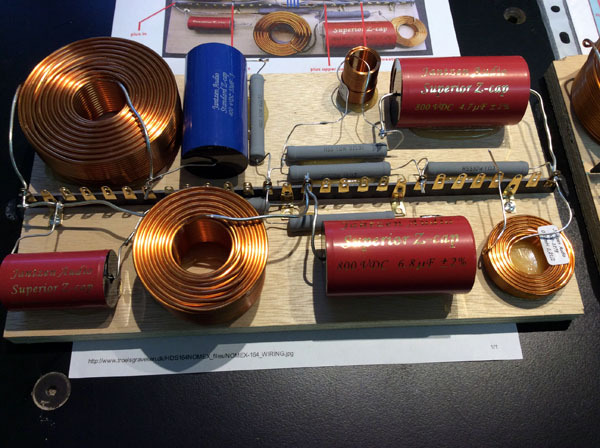 The other was skilled in electronics and could do the crossovers and wiring. I was the bag man, paying not collecting! We came to the project with the plan to make no changes, except one, to your box design; why pay for a tested design then tamper with it? We did accept your suggestion to increase the internal volume of the enclosures to 40l by adding the extra depth to the boxes. Curved shapes and other ideas were avoided for the same reason. Otherwise we aimed for the highest standard of construction and finish. My Danish friend has Dynaudio Confidence 11’s and so with apologies to Dynaudio we used the recently superseded Contour S3.4 look by adding a lookalike Dynaudio base plate/plinth and driver grills. 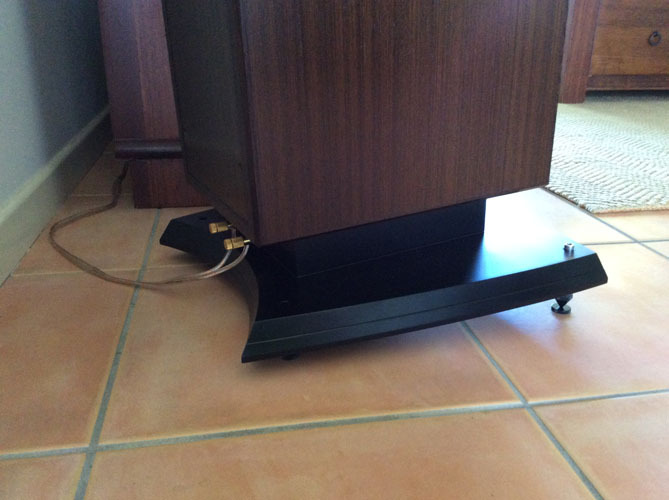 This elevated the cabinets and also allowed a 3 degree tilt and a nice neat arrangement for terminals and cables. 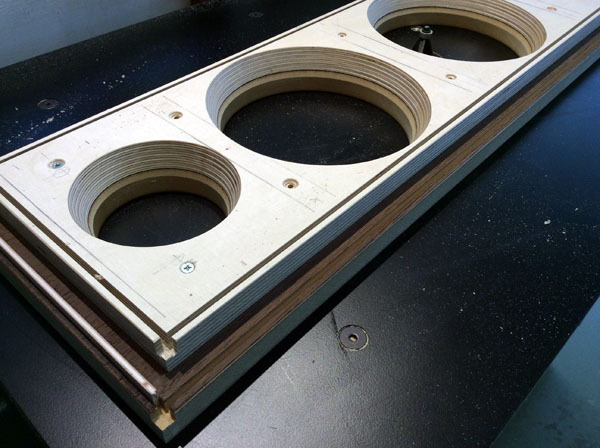 The above exception: the enclosures were made in 18mm Baltic birch ply. Once the boxes with internals, braces, insulation etc were completed to your exact dimensions we built a second set of boxes in 18mm MDF laid with South African wenge veneers. The second boxes had the internal dimensions exact to the externals of the ply boxes. The outside of the ply enclosures were then skimmed with a belt sander and slipped inside the wenge boxes. The result was very dense, rigid 36mm walled cabinets with heaps of mass. 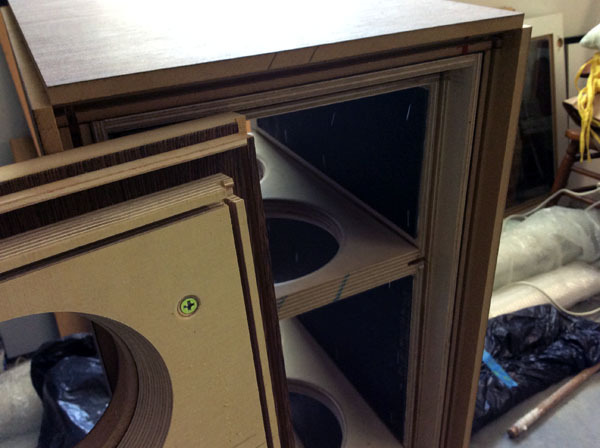 No screws were used anywhere in the joinery except from inside the ply boxes to lock them to the outside MDF skin. As you can imagine this project could not be well executed without considerable expertise from my Danish friend in his well equipped workshop. 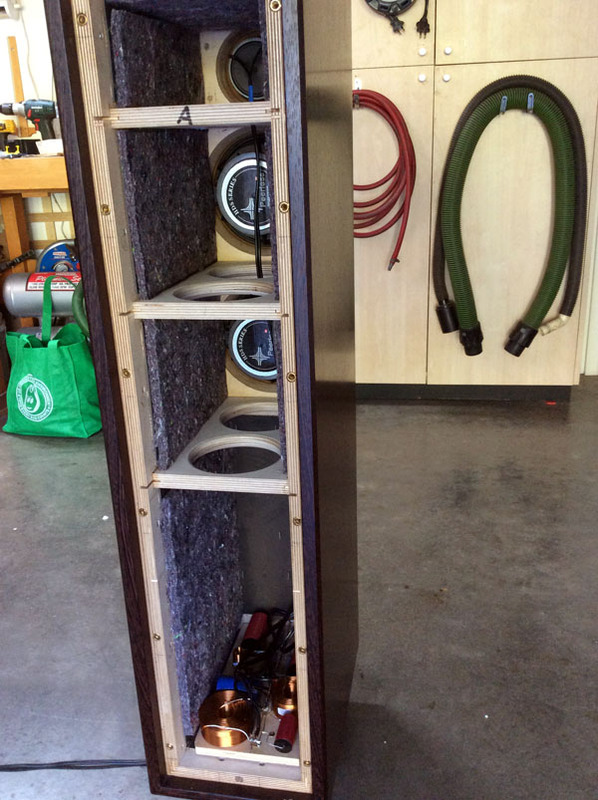 He has had a lot of speakers over the years and has built his own before. I think he has had the idea for a while that such a robust construction could have definite acoustic benefits. Something certainly did, if not your design. The completed speakers are hooked up to a Musical Fidelity M3 integrated amp, Rotel RCD 1072 and ERA turntable with SME 3009 improved version arm. All modest gear I admit. However the speakers replaced 35 year old JBL L40 monitors driven by a NAD 2030e. In my house the change was a revelation, an entrée into a world of really beautiful music that my wife and I have not enjoyed before. The clarity and musicality of, for example, Leonard Cohen’s track “Going Home” and Melody Gardot’s “La Vie en Rose” would have me feeling the singer is sitting a few meters opposite giving me a private audition. The bonus is the cabs are so good looking as furniture I am sure you will agree. My Danish friend, Ib Mortensen, has had a lifetime of experience with hifi and he will email you separately with his listening impression of the construction. There is one thing about the project that I was quite unprepared for: the pleasure we got from cutting up sheets of ply to make wooden boxes with wires that came alive and speak with beautiful music. Money can’t buy that. We made a detailed photographic record of progress however the few enclosed should be enough to give you a good idea of what we did. All up the project cost almost A$2000. 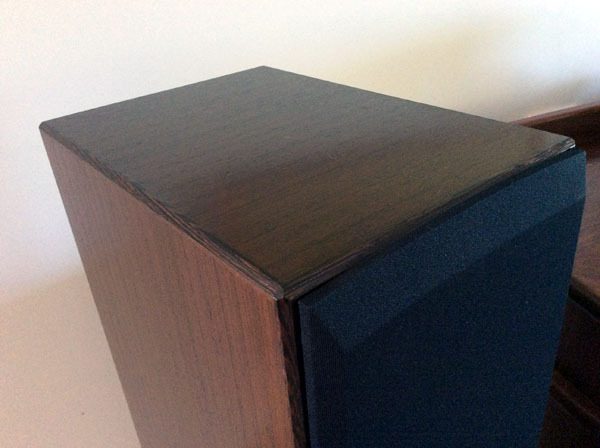 We did not spare expense with the crossovers, ply and wenge veneer and all the drivers and removable back panels were fixed with brass screw inserts. It was a fun project and celebration was with Aalborg Akavit, of course! 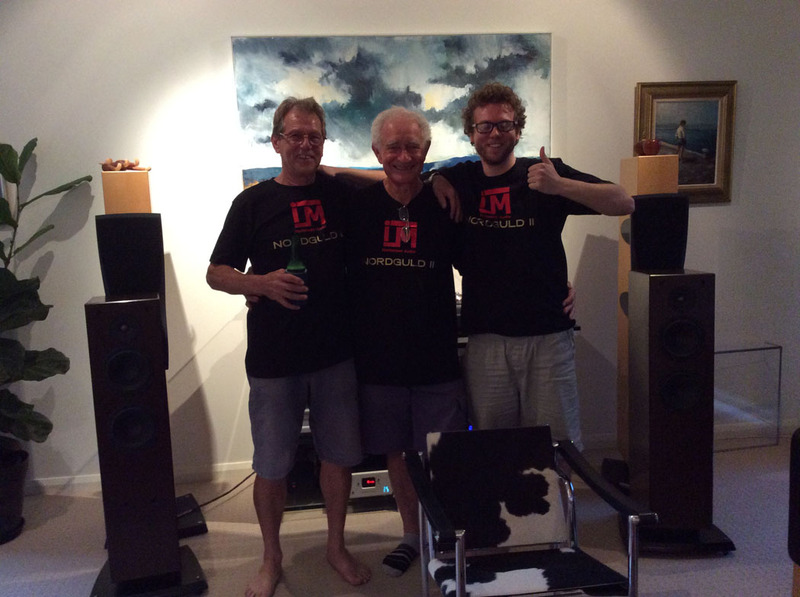 For the benefit of your Scandanavian readers I can tell you that the Logo on the t-shirts is for Mortensen Audio, and that the model name Nordguld 11 we gave the speakers is after my friend’s favourite Aalborg drop! Thanks so much for sharing your passion and knowledge. I really appreciate it.